What do you do with left over idlis? In my home, they take the form of Upma as a quick tiffin on a busy day, Fries as a tea time snack and Manchurian as a starter to serve friends on a rain filled day. This unusual yet unique fusion food that takes an Indo Chinese avatar is soft on the inside with a crisp exterior. Tossed in sauces and combined with bell peppers, the end result makes it hard to identify that the main ingredient is our humble Idli. 2 In a bowl, combine maida, cornflour, salt, ginger-garlic-green chilli paste and water to make a thick paste. Dip the idli pieces into the batter such that its well coated. Place each piece that is well coated with the batter into the hot oil. Do not crowd the vessel. Reduce flame and deep fry till it turns lightly brown. Increase the flame towards the end of the cooking process and fry till it turns golden brown. Remove onto absorbent paper and keep aside. 5 Reduce to medium heat and add the brown sugar, soya sauce, tomato ketchup, chilli sauce and vinegar. Combine well and cook for 2 mts. Add 4-5 tbsps of water and cook for 2 mts. 6 Add the deep fried idli pieces and combine. Toss on high flame for 1-2 mts. Turn off heat. Garnish with the chopped spring onion greens or coriander leaves. Thank you so much for coming up with an innovative idea for using left over idlis. I think you shouldn’t care about the ideas..you are putting a lot of effort in referring, experimenting and sharing ur yummy recipes with us. that’s more than enough! u r helping beginners like me. I was once upon a time the worst cook but after trying ur recipes, my hubby says that i am the best! all thanx to u.
Wow, what creativity? The picture is yummy…Will sure try it soon. 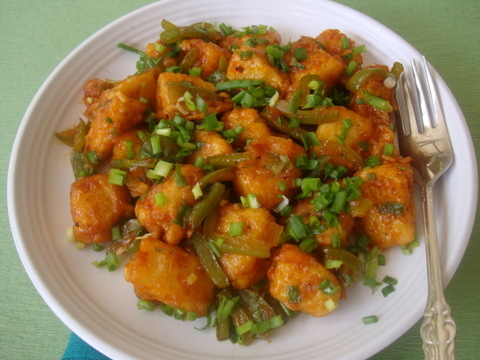 Idly Manchurian looks super yummy Sailu. Nice idea to finish off the leftover idlies….luv it! Nidhi, Glad you tried the recipe. But, please watch what you say here. Everyone’s taste buds are NOT the same. We should thank Sailu for coming up with those innovative ideas. This sounds awesome…mallu-chinese!!! My oldest son is not too fond of idlis..this sounds like something I can entice him with. Nidhi, hope you might be in your learning period of cooking. Don’t give up. You can also cook yummy food from yucky food. All the best. Nidhi, 1stly don’t call any food items made at home, with love & care “yucky”, if u don’t like it don’t appreciate it but 4 god’s sake don’t condemn it. can we do this with rawa idlis. Why not? I am yet to try with rava idlis though. Do try and leave your feedback. It looks yummy and I am sure it would taste yum yum yummy… Thanks for posting such a lovely recipe. really very very innovative… Yesterday I tried out tomato soup, it turned out very nice. NIDHI – Please do not comment food items as “Yakkk”. If you do not like any recipe, just don’t try it. In case you try and it turns out disaster, try to check where u went wrong. Thanks Sailu for yet another colourful and novel recipe. Hats off to your iddli monchuria. Thank a lot…..Sailu. Thanks Sailu for yet another colourful recipe,& i prepared it, has a yummy taste. Lovely recipe. Just a small doubt. Wont idly absorb too much oil when deep fried? just a small speculation. When coated with cornflour and maida batter, idli does not absorb too much oil. Nidhi, I was surprised to see the tone of your comment. I’m of the opinion that if you can’t say good about something or someone, then it is better to keep quiet and not spoil the atmosphere. Hope you have better experiences in your kitchen!! looks yummy .. but idli n oil ? 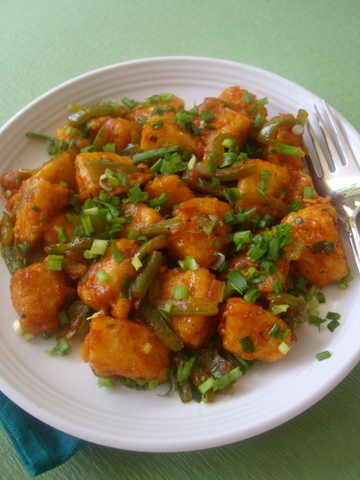 Such a delicious manchurian recipe Sailaja…loved it so much and thanks for sharing. Is it possible to make this without deepfrying the idlis? So many calories! Yes, you can. Pre-heat oven to 160 C and drizzle some oil on the baking tray. Toss the idli pieces in black pepper pwd or chilli pwd and place on baking tray. Bake for 20-25 mts. During the baking process, remove the tray from the oven and turn the pieces once and bake. Follow the rest of the procedure according to the recipe. I tried the baked version like you posted and it was yummy! Thanks. The only thing I did different was to substitute the chilli sauce with Korean Chilli paste and omit the red chilli powder. Thanks for this recipe will surely make it again. We also tried the Chicken Masala balls on your blog and it was a hit with my family. Hey Sailu, Thats so different, great thought. Could you clear me a doubt? The Idlis are soft, can we mash the idils and add some vegetables and little bit of chill for spicy touch and then do the further process . I think you are not fond of home food; if you would be, you would not comment on others. Hence forth see that don’t leave such comment or while talking to anyone, such words would not come from your end . You should thq her and the friends who are suggesting you to try the recipe. This is only a friendly suggestion. I hope you would take in an positive way. I have not tried that method of mashing idlis and using vegetables. The idlis need to be refrigerated and this recipe works with left over idlis that harden on refrigeration. Adding ginger-green chilli paste to the maida batter gives a spicy touch. Could you post more healthy foods. Now a days there are many chefs coming up with recipes that are not really healthy. Majority of them are deep fried and ofcourse recipe creation becomes easy with deep frying. I have read some of your recipes, but I wanted to correct your english. Instead of Combine (kalupu), please use words like sauting or mixing. Nothing to offend you. its very yummy to look at. I have been referring to your blog for few yrs now and your instructions are clear and pics are very good.Just found the oppurtunity to comment today. I think the huge drawing factor among the zillion food blogs is that you have creative recipes I like. Good, keep up the good work, I like your zardosi artwork too. Anyway I really dont like idlis, but just hit this recipe out of curiousity and tried yesterday, it took me an hr may be because of the 1st time, but I should say, this is pretty damn good. Couldnt tell it was idli, my husband liked it and my 2 yr old had a bite which is a big deal. I like the idea of baking, because, I need to reduce the calorie intake but still be able to eat yummy food. Hey one que, you had written about the baking process, does that skip the “idli dipping in the batter” process, just bake using pepper powder and some oil on the tray? how does it get crispy? good tip, I will def try soon. You don’t need the batter at all if going the baking way. Just sprinkle some idli podi OR pepper pwd OR chili pwd and a pinch of salt on the idlis and place on a baking tray that is drizzled with some olive oil. I tried this with rava idlis and it turned out great! Also tried adding schezwan sauce once and voila!! we had idli schezwan 🙂 thank u! Hey Sailu, thanks so much for sharing your recipe with us. It takes effort to do all this – your website is awesome and I can’t wait to try out the other recipes. thanks, very kind and generous of you.